Simplifies digital design by turning your editor of choice into a modern VHDL IDE. VHDL-tool is a VHDL syntax checking, type checking and linting tool. It is also a language server for VHDL, making IDE features such as finding definitions, references and autocompletion available within editors that support the Language Server Protocol. It can be run as a standalone command line application or as a daemon, making its services available from within your editor through editor plugins. 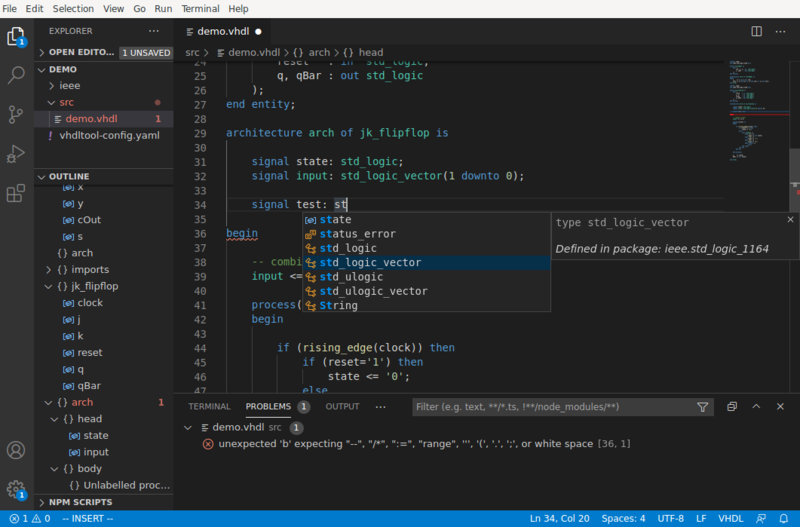 Visual Studio Code, Vim, Emacs, Sublime and Atom are supported. It comes in two versions: free and premium. The free version is available on the downloads page. The premium version is still in beta while we get it production ready. It will be publicly available soon! For now it's 64 bit Linux only. It has been tested on Ubuntu 16.10, Red Hat 7 and Arch Linux.